Friday September 9th, 1513 was a very black day for Scotland. It was a day when Scotland lost a King and the flower of its nobility. It plunged the country into a morass of uncertainty and rivalry for the throne and left its government weak and ineffective, especially in the Borders. In the summer or 1503, Princess Margaret, daughter of King Henry VII of England married the Scottish King James IV in Scotland. This union cemented a peace between the two countries. Even at that time the wise and perceptive Henry of England could see that eventually, a descendent of this marriage would rule both kingdoms and bring stability to the whole island. The Borders were a place in constant turmoil and not under the full control of either the English or Scottish crowns. King James determined to bring some kind of order to his side of the border and he managed to keep it under control by harrying and hanging miscreants, as did the English, but it was never a haven of peace and tranquillity. Events such as the murder of the Scottish Middle March Warden, Robert Kerr at a truce day in 1511 did nothing to aid fraternal feelings. The end for any chance of peace between the two kingdoms was the death of King Henry VII in 1509. He was succeeded by his larger than life son, the famous Henry VIII, who certainly had no love for Scotland or the Scots, despite his sister being married to the Scottish king. Under Henry VIII of England, strife on the borders was increasing and there were clashes between each countries respective navy at sea. The main factor which lead directly to the Battle of Flodden, was most likely the sharp increase in foraying by the English during August 1513. Having had quite enough, the Scots retaliated and sent a raiding force of their own into England. This force contained between 3,000 - 7,000 riders, the exact figures are unknown. The Scots gathered much plunder but the amount of it made them slow getting back across the border into Scotland. This was to prove fatal. They were ambushed by the English under Sir William Bulmer and the Scots forces were decimated in the encounter. This raid later became known as the 'Ill Raid' and brought matters between the two countries to crisis point. Despite earnest counsel not to, King James of Scotland crossed the border in late August with an army estimated to contain between 60,000 - 100,000 men. He attacked and took English strongholds, demolishing them in the process. England were fortunate that in this dark time there came the man for the task, in the form of the Earl of Surrey, a skilled fighter and hardened veteran. 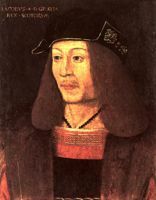 He was more than a match for King James IV of Scotland, and despite being outnumbered, he managed to outgeneral the Scottish monarch. The Earl of Surrey got behind the Scottish forces encamped on Flodden Ridge, near the village of Branxton in Northumberland, where they had placed their heavy guns so as to give an excellent arc of fire over Millfield Plain. This unexpected maneuver by the English cut off the direct line of retreat to Scotland and forced the Scots to abandon their position on Flodden Hill. Having lost their well prepared position, in great haste the Scots relocated their forces to to the ridge of Branxton Hill, where they faced the English. The heavy guns of the Scots could not be placed in good defensive positions in time and in the opening shots of the battle, fell victim to the much lighter and more accurate field pieces of the English. Home and Huntly are the first units of the Scottish army to attack the English. They descend from Branxton Hill, maintaining disciplined pike formations and rout Edmund Howard's forces on the English side. It is only the timely intervention of Dacre's mounted force of Borderers that prevent the English from fleeing the field of battle. Hume then retreats to higher ground to regroup but then takes no further part in the battle. This seemingly cowardly or treacherous action, along with other later intrigues, were to cost him his head. Next to attack the English were Errol, Crawford and Montrose who struck at the English centre. However, the ground underfoot was extremely marshy and the pike formations lose both momentum and cohesion. The English, with an advantage of higher ground and seeing the difficulties of the Scots pikemen, attack with their billhooks with devastating effect. King James of Scotland is by this time losing control of his forces and proceeds down the hill to attack the English with his formation. This leads Argyll and Lennox to also join the fray in order to protect their King. Unfortunately this has the effect of compacting the Scottish army and boxing in the King. The final blow falls when the English Lord Stanley approaches from the east with his archers and thus prevents Argyll and Lennox from fully supporting their King, as they turn to face this new adversary. This gave the day to the English and the Scots army was decimated. The English longbow had once more proved to be decisive in a battle, but it was the last time it was to do so. War and weaponry was changing and the bow would become ineffective. Flodden was the first battle where the armourer was decisive to the outcome. The Scots pikes were not effective against the English archers and the billhooks of the infantry. The English billhooks were vicious weapons with a cleaving edge that lopped the tops off the pikes and lances of the Scots. It turned them into nothing but poles, useless for anything but prodding the enemy. Whilst the Scots pikes had been devastating against the English at Bannockburn, technology had moved on and the Scots had been left behind. During the battle the English archers mostly took a backseat to the billhooks of the infantry, a sign of another change about to take place on future battlefields. The Scots were defeated and suffered a most grievous loss when King James IV of Scotland fell whilst fighting with his army. The kings bloodied and stripped body was later found on the field of battle by the Englishman, Lord Dacre - himself a March Warden, who was never forgiven by the Scots for that fact. 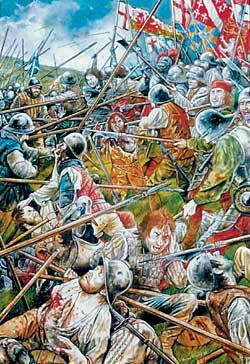 In all around 10,000 Scotsmen fell at Flodden, including twelve earls, thirteen barons, five heirs to titles, three bishops and two abbots. The cream of Scotland's nobility had been wiped out at a stroke. It was a devastating blow from which Scotland was never truly to recover. However, King Henry VII of England was to be proved right. A Scottish descendent of King James IV and his daughter Margaret did sit on a joint throne, in the form of King James the VI of Scotland and the I of England in 1603. The flowers of the forest are a wede away.